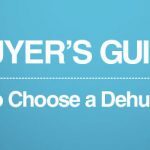 Home » Guides » GUIDE: What Size Dehumidifier do You Need? Choosing the right size or capacity is vital when buying a dehumidifier. Unfortunately, many people are confused by what size actually means and how it affects water extraction. 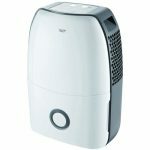 In this article, we’ll take you through the basics of size to help you choose the best dehumidifier for your home. When people talk about a dehumidifier’s size, they usually don’t mean its physical dimensions. Instead, the size or capacity is how many litres of water it’s able to extract per day. In practice, larger capacity models tend to be physically bigger too, but this isn’t always the case. Capacity is not the same as the water tank size. This is listed separately by manufacturers and is usually between 2-6 litres. As you’ll notice, most machines have a tank that’s considerably smaller than the daily capacity. This doesn’t mean you’ll need to empty it multiple times per day though, as it’s rare for a dehumidifier to extract its full capacity each day (extraction varies depending on temperature and humidity). The Meaco Dehumidryer has a large 25 litre per day capacity that’s great for whole houses. It’s a refrigerant model though, so doesn’t work as well in cooler conditions. Every brand provides a capacity for their machines. This is a useful figure for comparing machines, but is usually the maximum extraction in ideal conditions. If you go to a manufacturer’s website, they often provide the humidity and temperature the capacity was measured at. In reality, a dehumidifier will rarely reach these numbers, so it’s not the only factor affecting a machine’s extraction effectiveness. This is because extraction varies greatly depending on the temperature and humidity of the air. That doesn’t mean capacity should be ignored though. As a general rule, bigger capacity dehumidifiers can deal with larger spaces and higher levels of moisture. A low capacity model that can manage humidity in a small room with mild damp may struggle with multiple rooms. And if you want a whole house dehumidifier, it’s essential to choose one with a large capacity. The size of the environment you want to dehumidify. This should be measured in square metres, as that’s the unit quoted by manufacturers in the UK. The level of moisture in the environment. This is a more subjective measure, unless you use a humidity monitor. But you should have an idea of how damp a space is by noticing where moisture is accumulating. The temperature of the environment (more on this in a minute). The DD8L Zambezi is an example of a desiccant dehumidifier. These models often have lower capacities but work best in cooler environments. It’s probably obvious that the larger the room(s), the greater capacity you’ll need. Rooms with severe damp problems also require larger capacities. Signs of severe damp include stains on walls, condensations on walls and, in the worst cases, wet floors. What isn’t so obvious is that temperature can affect your decision. This is because desiccant and refrigerant dehumidifiers work better in different conditions. Desiccant dehumidifiers tend to have lower listed capacities than refrigerant. This doesn’t mean they should be ignored though, as they are far more effective at removing water in cooler conditions. 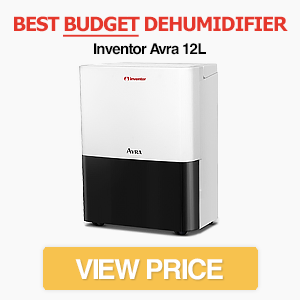 For example, at temperatures of 10 degrees Celsius or below, a desiccant dehumidifier with an 8 litre/day capacity may extract significantly more water than a refrigerant model with a higher listed capacity. On the other hand, refrigerant models usually have a higher maximum extraction rate in ideal conditions (high humidity and temperature). Dehumidifiers range in capacity. The smallest start at around 500ml per day. These models are often cheap but are only suitable for single rooms, boats or caravans. At the other end of the spectrum, the most powerful dehumidifiers can have capacities of up to 25 litres per day. Meaco, for example, produces the excellent Low Energy Dehumidryer with a 25 litre capacity. As you would expect, the largest capacity models tend to be more expensive. Most dehumidifiers fall between the two. Refrigerant models often have larger capacities of 10-20 litres per day. Desiccant models usually fall in the 7-12 litres per day range. The chart below provides a quick guide to sizing a dehumidifier. The numbers are based on those provided by the Association of Home Appliance Manufacturers in the US, but we’ve converted the units to match UK models. Keep in mind that these numbers are only a guide. 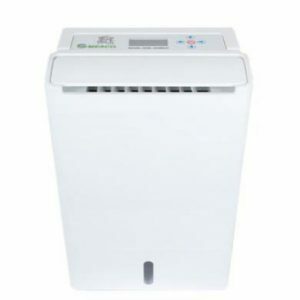 As we’ve discussed, there are other factors that affect the effectiveness of a dehumidifier, including the type (desiccant models tend to have lower listed capacities but are more effective in cooler conditions) and temperature of the environment. The top row is the size of the room or environment you want to dehumidify. The first column is how much moisture the room contains. 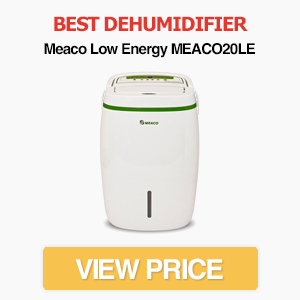 Size, which refers to the quantity of water a machine can extract per 24 hours, is one of the most important factors when choosing a dehumidifier. As a general rule, the larger or damper the room is, the greater the required capacity. This is just a broad guideline though. In reality, the extraction efficiency of dehumidifiers varies a lot depending on the quality and type of the machine. Two machines with identical capacities, for example, might perform very differently once you get them into your home. That’s why it’s important to read dehumidifier reviews before you buy. 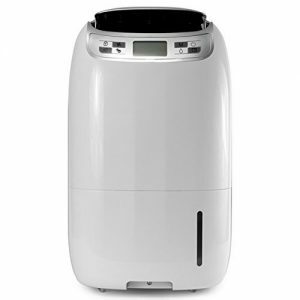 EcoAir DC12 Review - Is This the Best Portable Dehumidifier?